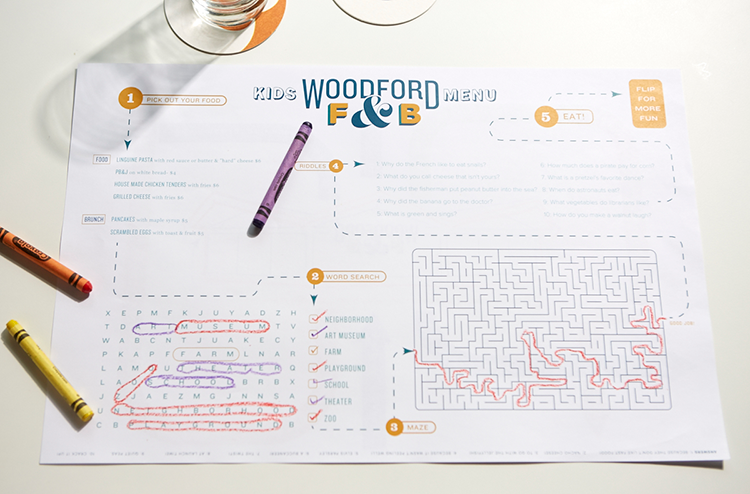 Woodford Food & Beverage occupies the corner of a busy intersection at the center of several neighborhoods. The building was constructed in the middle of the 20th century as a neighborhood steakhouse, and Woodford F&B's decor keeps the sleek mid-century vibe alive with lots of warm wood, white formica booths, zinc bartop, and original terazzo floors. The brand is easygoing, utilitarian, with large-scale diner-style menus, matchbooks, kids' menus, and custom carafes for wine (plus printed bags to take the leftovers home). The feel is vaguely vintage but fresh, with classic elements and unexpected touches.